Environmentalists are alarmed that President Donald Trump is following through on his campaign pledges to roll back Obama-era rules that tightened restrictions on greenhouse gases, promising the moves would lead to more American jobs and economic growth. At a recent rally in Charleston, West Virginia, under a "Trump Digs Coal" banner, the president announced plans to roll back the Clean Power Plan. 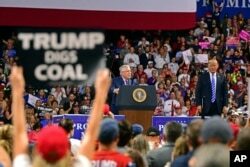 Republican Senate candidate, current West Virginia Attorney General Patrick Morrisey, speaks as President Donald Trump listens during a rally, Aug. 21, 2018, at the Civic Center in Charleston W.Va.
Trump’s plan abandons the previous administration's goal of scaling back U.S. reliance on coal and reducing the nation's carbon emissions by a third by the year 2030. Instead, Trump wants to allow coal-producing states like West Virginia to set their own limits on greenhouse gas emissions from coal-fired power plants. Earlier this month, the Trump administration proposed a repeal of the American Clean Cars Standards, the Obama-era regulation that set stringent limits on vehicle fuel-efficiency and emissions. The proposal include revoking the rights of states to set their own strict vehicle emission targets, setting up a legal battle with California and 18 other states with ambitious clean cars programs. 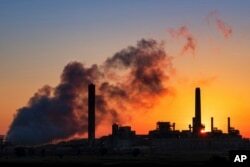 Even the administration's Environmental Protection Agency's own analysis acknowledges that increased pollution from the rollback of the Clean Power Plan could lead to 1,400 more premature deaths each year by 2030. Carbonell said this would mean health and economic costs with potentially "billions of dollars in net harm to Americans resulting from this proposal even after you take into account the compliance cost." FILE - the Richmond city skyline can be seen on the horizon behind the coal ash ponds along the James River near Dominion Energy's Chesterfield Power Station in Chester, Va. The plan is supported by the industry lobby that says Trump's coal-friendly policies create jobs. Jason Bostic from the West Virginia Coal Association said that since Trump took office, the state has added about 3,000 direct mining jobs. He dismissed criticism that coal is a dying industry that hurts the environment. “I think what you have are critics outside of this industry that are a little bit unrealistic in their goals about a renewable economy built on wind power, wishes and unicorns.” he said. If approved, Trump's proposal, called the "Affordable Clean Energy Rule," could keep coal plants operating longer, by allowing them to invest in facilities without having to upgrade pollution control technologies to meet existing standards. Yet, experts are skeptical the proposal would actually would save coal jobs in the long term given that there are cheaper and cleaner energy sources like natural gas, and that the cost of renewable energy like solar and wind continue to drop. 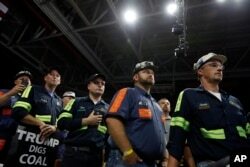 Coal miners listen as President Donald Trump speaks during a rally, Aug. 21, 2018, in Charleston, W.Va.
Blair Beasley of the Bipartisan Policy Center said, "The coal industry is still facing some pretty significant headwinds,” despite Trump's rollbacks. Most analysts believe Trump’s proposal is driven more by political rather than economic considerations. In West Virginia, Trump's approval ratings are almost always above the national average. Beasley noted, however, that as the power sector transitions away from coal, there are communities that potentially could be left behind, and this is an important consideration in policymaking. The Clean Power Plan was blocked by the Supreme Court in early 2016 and never implemented. Yet, West Virginians blamed President Barack Obama for the decline of the coal industry. In his last year in office, Obama’s approval rating in the state was 24 percent, the lowest in the nation. Jake Zuckerman, political reporter at the Charleston Gazette-Mail said that a fair criticism for the Obama administration is they did not hold public hearings in West Virginia on the Clean Power Plan. "I think that people got this feeling that they weren't being heard, which I think carries a lot of weight here," he said. FILE - the Dave Johnson coal-fired power plant is silhouetted against the morning sun in Glenrock, Wyo. Now these coal miners feel Trump is listening. At the Trump rally in Charleston, Kevin Abbot from Gilbert, West Virginia, said he lost his job under Obama, but now he's back to work. “I’m tickled to death," he said. "The pay went up. The mining industry went up. So, everything’s looking real good as far as mining goes." The administration’s proposals to roll back antipollution standards are in line with Trump’s decision to withdraw from the 2015 Paris Agreement. Every country in the world except the U.S. and Syria, are now signatories of the agreement, which aims to mitigate the effects of global warming.